← Opps, you got stepped on! Aprons have many different uses, they can be used for outdoors when gardening, they can be used in in the kitchen for cooking, in the art room for painting, in the hospital for protection or in the classroom for clothing protection…the main thing is blocks a possible hazardous situation for hurting you or ruining something that belongs to you. Life in general will bring joy and will bring daggers. Life is complex and yet so simple. Your happiness depends on how you react to any particular situation at any given time. You can choose to worry and complain; or you can choose to take it by faith to God in prayer and leave it there. The devil is out to get us and uses the daggers and complexity of life to get us down. He takes the everyday trials, sickness and struggles that everyone deals with and magnifies them in our mind and makes it seem as if we are the only one who has to deal with these types of issues in our lives. He is a roaring lion, and looking to take us out…But there is indeed hope! God says in His word that if we put on the whole armor of Christ He will help us STAND against the wiles of the enemy. Can I tell you that YOU have secret weapon….are your ready for this? PRAYER! Yes, prayer is our “Protective Garment” and is simply communication between us and God. Prayer is our constant connection with God, yes this means on a daily basis. Sometimes we may have to pray a few times a day to get us through. Prayer is our guard, prayer is our covering, prayer is our protection because it connects us directly to the one who gives strength. The bible says the joy of the Lord is our strength. With Gods strength we can muster up enough courage and confidence to give the enemy a black eye through our prayers and through our worship. Here is the key, in the middle of our trials we worship. In the middle of our despair, we worship. In the middle of hopelessness, we worship. In the middle of our kids falling away from God, we worship. In the middle of losing a job, we worship. In our ups and in our downs we worship! In the midst of putting on the Garment of praise for the spirit of heaviness we know Prayer is the Garment that protects us, protects our hearts, protects our minds, protects our families, protects our health, and protects our lives. 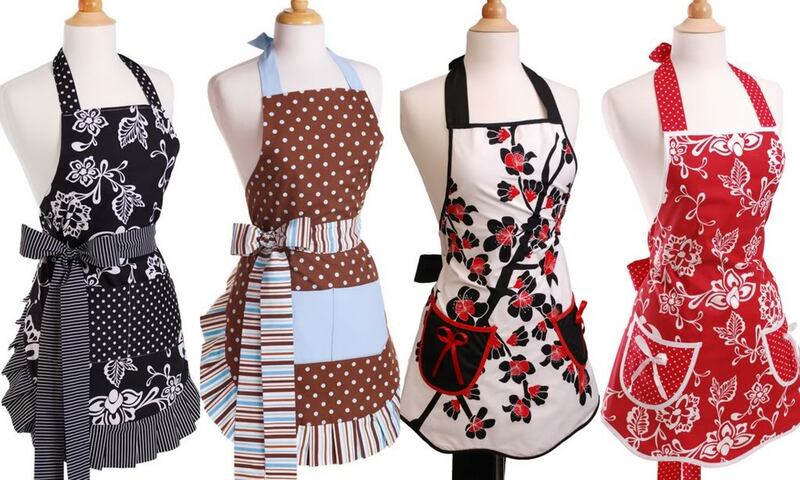 You need to know the type of apron, (protective garment) you need to put on for each situation that arises in your life. In order to do that we need to be equipped with the Word of God. The Word of God will guide in every situation that may arise in your lives. The apron for Fear would be 2 Timothy 1:7 For God has not given us a spirit of fear, but of power and of love and of a sound mind. The apron for chaos would be peace. Philippians 4:7 And the peace of God, which passeth all understanding, shall keep your hearts and minds through Christ Jesus. John 14:27 Peace I leave with you, my peace I give unto you: not as the world giveth, give I unto you. Let not your heart be troubled, neither let it be afraid. The apron for anger would be Proverbs 15:1 A soft answer turns away wrath, but a harsh word stirs up anger. The apron for loneliness would be Deuteronomy 4:31 For the LORD your God is a merciful God; he will not abandon or destroy you or forget the covenant with your ancestors, which he confirmed to them by oath. The apron for a tough situation would be Romans 8:37″No, in all these things we are more than conquerors through him who loved us. The apron for a broken heart would be psalms 147:3 He heals the brokenhearted and binds up their wounds. Dig into the Word of God and you will find the “apron” you will need for the situation you are going through. One thing to remember about aprons is that the get dirty daily and the apron you used the previous day will not be good for the next day becuase it is dirty and used. We cant depend of yesterdays prayer to carry us through today struggle. Make sure you have a fresh apron of prayer and Word daily to get you through whatever your day may bring to you. Your apron of prayer will be the key to protect you from any messy situations and from whatever the world or the enemy tries to spill on you! I’m thankful to know know my redeemer lives and cares for me. I’m thankful God has already given the keys to over come the struggles that WILL arise in our lives. Aside | This entry was posted in Uncategorized and tagged apron, Church, cooking, dispair, God, help, hope, Jesus, joy, love, peace, Prayer, struggle. Bookmark the permalink.